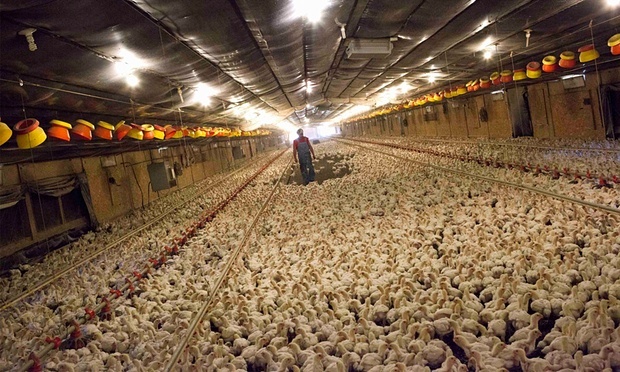 WILL THE WORST BIRD FLU OUTBREAK IN U.S. HISTORY FINALLY MAKE US RECONSIDER FACTORY FARMING CHICKEN? | "Global Possibilities"
Home » Food » WILL THE WORST BIRD FLU OUTBREAK IN U.S. HISTORY FINALLY MAKE US RECONSIDER FACTORY FARMING CHICKEN? WILL THE WORST BIRD FLU OUTBREAK IN U.S. HISTORY FINALLY MAKE US RECONSIDER FACTORY FARMING CHICKEN? The administration of the foam – either by nozzle or, more commonly for commercial farms, a foam generator – is a rolling process, meaning workers apply foam to birds at one end of the house, and then work their way, contained area by contained area, to the opposite end. The avian influenza outbreak, which originated from the droppings of waterfowl carrying the virus, is showing signs of tapering off as temperatures continue to rise across the country. The virus is weakened by warm, dry conditions. This is likely, at least in part, because sunshine and warm backyard temperatures are effective at killing the virus, says Dr Michael Greger, director of public health and animal agriculture for the Humane Society of the United States.